Its Leo Geoghegan chasing Bob Jane through Hell Corner for the blast up Bathurst’s Mountain Straight, I’ve my money on the punch of the Jag’s mid-range torque not to forget its beefy top end over the delicate little Elan. Timeless, twin-cam designs both. I’ve written about these blokes often enough for international readers to know they were both prominent Australian champions- Bob best known for exploits in touring cars and Leo in open-wheelers. 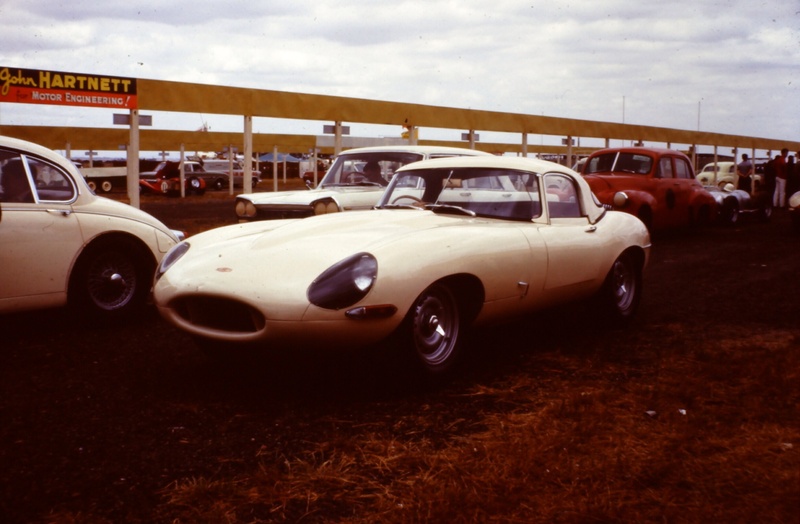 Here they are on ‘neutral ground’, sportscars, during the Easter meeting in April 1965. Jane got the better of Leo in both the 5 lap preliminary and 13 lap NSW Production Sportscar Championship, winning both races from the Sydneysider, top speeds of the cars were 147.05 and 142.85 mph (Elan) on Conrod Straight. I notice Bob’s Jag has a Victorian number plate. The successful businessman lived just off Kew Boulevard in Melbourne’s leafy inner east, no doubt it got some exercise on that marvellous stretch of road from time to time. 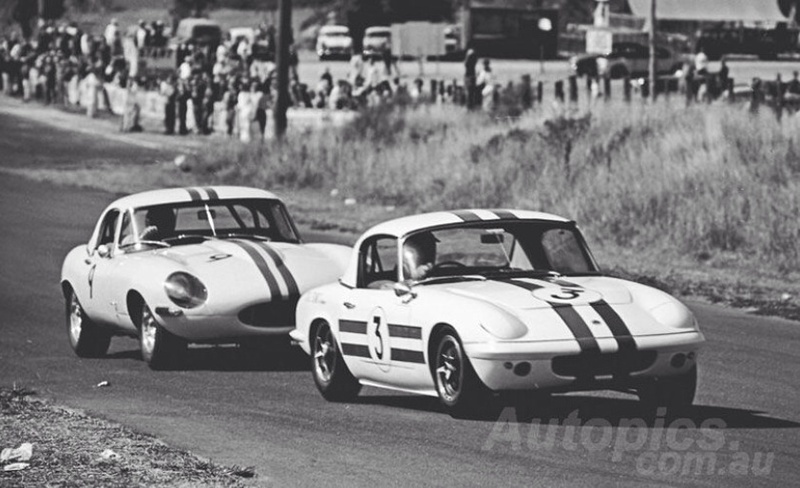 I’ll get around to an article on Jano’s E Type one day, for now enjoy these shots of a couple of great sixties sporties. The knock-off (on knonk-on, if you will) wheel nuts on the Elan are straight out of Ben-Hur/James Bond. Such a period fitment aren’t they David? When were they mandated out of racing existence I wonder? Or were they. The great shot catches the fine detail of both cars, beautiful as they are! The elan was on pole (have photos of the start) . 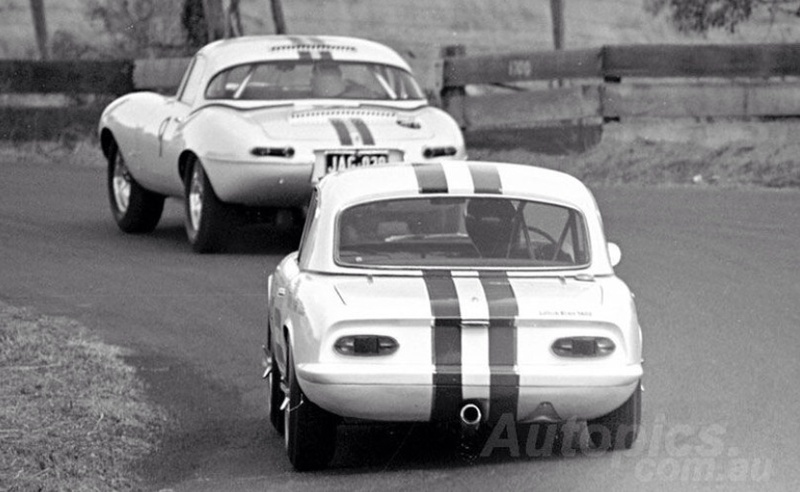 the story dad told , always bought a good laugh, when he went under the jag into forest elbow, Bobs jaw dropped the elan broke a rubber doughnut which restricted the drive.He swore if not for that he could have beaten Bob in the 13 lapper as the jag was out of brakes. Both great mates and the best years of motor racing. Great story, I was a big fan of your dad albeit I was late to the party only seeing him race in 1973/4 in the two Birranas. A great champion, key ‘Leo Geoghegan’ into the primo search engine, there must be 4 or 5 features at least.